Begin your lives together in a beautiful place. One of the most stunning and in-demand Southern California wedding venues, Taglyan has a reputation of standing apart from the rest. Featuring décor that is decadent yet sophisticated, over 12,000 square feet of space, and one of the largest stain glass ceilings in the world, Taglyan’s grand ballroom makes the ultimate wedding setting. 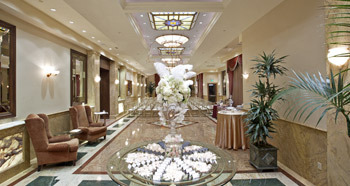 Aside from our grand ballroom, we also offer romantic gardens or an elegant foyer for weddings. Taglyan’s unparalleled beauty, incredible catering, and superior service make it one of the most sought-after SoCal wedding venues. We bring together a strong team of wedding planners, chefs, servers, and industry professionals to bring your wedding vision to life. Our luxurious grand ballroom is known for its signature 5,000 square foot hand-crafted, stained glass ceiling, which creates a truly extraordinary atmosphere. The ballroom also features seven dazzling teardrop chandeliers, and an elaborate LED lighting system which can change the entire look of the ballroom to match the colors or theme of your wedding. At 7,000 square feet, the ballroom is the perfect size for extravagant and beautiful receptions. The foyer at Taglyan is perfect for sophisticated cocktail hours, small receptions, and intimate wedding ceremonies. It’s both beautiful and relaxing, with hand-crafted furnishings, stained glass windows, and marble floors. Draperies and amenities can be customized for your wedding, and the foyer also includes access to a private patio and a bar. This convenient and elegant space is the perfect addition to the ballroom. The Taglyan gardens provide the perfect backdrop for romantic wedding ceremonies, photo shoots, and cocktail hours. The picturesque gardens offer seclusion and intimacy, guarded by magnolia, cypress, and olive trees. Also featured are Renaissance-style stone fountains, marble columns, rose gardens, and pre-industrial era lampposts. For nighttime ceremonies or receptions, an LED lighting system illuminates the garden. At Taglyan, we love weddings! As one of the best Southern California wedding venues, we provide two picture-perfect options for ceremonies: our romantic, European-inspired gardens or our stylish foyer. Both options offer an inspiring and memorable setting for your wedding ceremony, and many of our clients also choose to book our adjoining ballroom for their wedding reception. This is convenient for couples and guests, since there will be no need to travel from the ceremony venue to the reception venue. Our ceremony spaces and ballroom make the perfect setting to start your new lives together. The cocktail hour, or “social hour” before a wedding is a time for guests to mingle and have a celebratory time together while the bride- and groom-to-be finish any last-minute preparations before they get married. The cocktail hour is the perfect opportunity for your guests to try your signature wedding drinks, craft beer, artisanal cocktails, or champagne, and to try the delicious hors d’oeuvres that our chefs prepare. We will work with you to create the perfect cocktail hour menu for your guests. Our fairy tale-like gardens or our stylish foyer make the perfect setting for this special pre-wedding time. 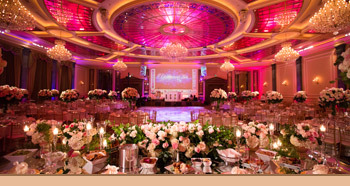 At Taglyan Complex, our specialty is our high-end, stunning wedding receptions. There’s a reason that we are considered one of the best Southern California wedding venue! With one of the largest stained glass ceilings in the world, enchanting teardrop chandeliers, marble pillars, and 7,000 square feet of space, our grand ballroom is the most popular of our spaces for receptions. However, many couples have also chosen our romantic gardens or our dramatic foyer for their reception. No matter which space you decide on, we guarantee that your reception will be absolutely beautiful, down to the last detail. Planning a wedding can be overwhelming and stressful, even for the most organized person. It’s exciting, but there are so many details to remember with the catering, attire, invitations, entertainment, flowers, and so on. That’s why having help is always a good idea. At Taglyan, we make sure you’re never alone in the wedding planning process. We work with you to help you define and bring to life your exact wedding day vision. Our team of experts will help you decide on décor, food, music, and vendors for your ceremony or reception. We have worked with the best in the industry, and when you choose Taglyan, you have access to them as well. Any special requests you may have in mind, from ice sculptors to calligraphers to photographers, Taglyan’s wedding planning services can help. When you decide to book one of our three Southern California wedding venues, our detail-oriented wedding planners will help you select the exact floral arrangements, centerpieces, table settings, dishes, color scheme, lighting, specialty stations, and other décor in order to help you achieve the specific look, style, and tone that you want for you wedding. We also have access to a wide network of florists and other decorators. Everyone agrees that food and drinks are one of the biggest highlights of any wedding. Our world-class caterers will work with you to design the perfect menu, from hors d’oeuvres to main dishes to customized cocktails. We’re here to listen to every detail, such as dietary restrictions and must-have dishes. Whether you want cocktail foods, a buffet, or family style service, we have you covered! No matter what kind of wedding entertainment you prefer to have, at Taglyan, we can accommodate your needs. With our drop-down high-definition projector screens, large dance floor, and state-of-the-art sound system, you can be sure that your guests will be impressed with the entertainment you choose. We’re happy to work with you to recommend vetted live bands or DJs, or you’re welcome to bring in your own! Because our catering is all prepared expertly in-house within our two top-of-the-line kitchens, our chefs and service staff are able to control everything that revolves around creating and serving outstanding cuisine. From sourcing the healthiest and freshest ingredients to serving your guests a beautifully-plated meal, we pride ourselves on our detailed and passionate process of catering. When you choose to work with our catering staff, you can select from one of our pre-set menus, or you can work with us to design your own personalized menu. At Taglyan, there’s no menu we can’t create, and no dining preference we can’t accommodate. We are here to serve you. Hors d’oeuvres are a perfect accompaniment during cocktail hour before the wedding ceremony. A sophisticated tradition, serving hors d’oeuvres during cocktail hour can also help curb hunger before the main wedding meal. At Taglyan, we offer a delicious variety of appetizers that your guests will love. Buffet-style dining is a popular choice, since it allows guests to pick and choose whatever they want, and to get as much as they want. Giving your guests control in this way will ensure that they are satisfied. They can select from carefully-prepared entrées, savory sides, and delicious desserts. One of the most popular choices when it comes to serving food, family style dining offers both formality and generous portion sizes. Platters of menu items are served to each table, and each guest selects whatever they would like from the platters. They get the control of a buffet, with the formality of fine dining. Many of our clients choose to have specialty tables at their wedding, such as chocolate fountains, ice sculptures, fruit displays, or champagne stations. These specialty tables add a unique element that always inspire conversation and look absolutely beautiful. At Taglyan, we love creative cocktails and signature drinks. Many of our wedding couples want to have their very own personalized cocktails to serve to guests, and our expert mixologists are happy to work with you in order to create this. We’re also proud to offer made-from-scratch artisanal cocktails, fine wines, and craft beer. Formal dining service from Taglyan is a truly special experience. Whether you choose a pre-selected menu or design your own with our catering staff, our formal dining service includes a multi-course menu, being served to your guests’ tables with complete poise and precision. To check venue availability or inquire about booking, please complete the form below. We’re so pleased that you’re considering Taglyan as a possible location for your wedding. After you complete the form below, one of our event managers will get in touch with you to confirm availability and discuss your plans in more detail.